Site moved to 37days.com/2008/05/make-dreams-com.html, redirecting in 2 seconds! "That's the dress I want!" 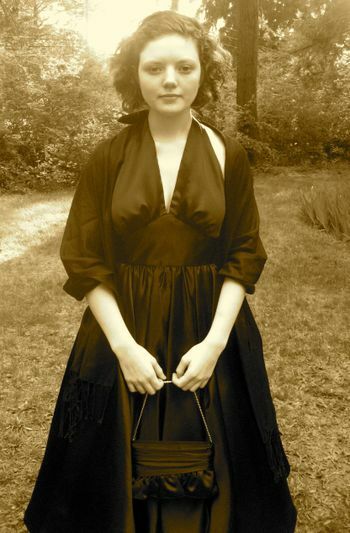 I peered at the computer screen over her shoulder, at a pink satin halter dress like Marilyn Monroe wore in the 1950s, with a crinoline petticoat underneath. "Does it come in black?" she asked, worriedly. "I'm sure it does...let's see." We clicked through all the choices--pink, gold, green, red. No black. I emailed the company. They wrote back "sorry." I emailed again to ask for the name of the manufacturer, thinking "let's go to the source." They wrote back that actually a manufacturer creates the dresses under the store's label and couldn't possibly get a black one done in time. There's just nothing I hate more than hearing someone say, "I can't." It had all started so innocently. An invitation to the Prom from a young man who has become very affectionately known as Kilt Boy. A need to match a Montreat tartan kilt. A 1950s halter dress that, as it turns out, not only didn't come in black but evidently has never existed in the history of online shopping in black. Trust me, I know. And, of course, the final ingredient--a mother who would eat raw tarantulas in hot sauce if it meant saving her daughter. 37days readers helped, sending links to beautiful dresses. "Not really. Nope. I mean, it's really nice, but not exactly," Emma responded to each one. Clearly, she would have settled for one that was sort of like what she wanted. But why? Have I mentioned that I like a challenge? An old friend from high school--haven't seen her in 30 years!--left a comment suggesting I get someone to make the dress. Thanks, Edie! She even found a pattern that was perfect. Just for kicks, I sent a note out to the neighborhood list serve I had started four years ago evidently Just For This Very Purpose. I envisioned myself on the corner of Sweeten Creek Road and Biltmore Avenue in a chicken suit begging for a prom dress by week's end. 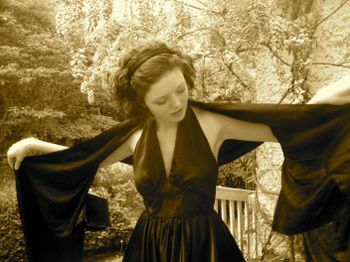 But, instead, within twenty minutes, I had my answer: the costumer for the local neighborhood Shakespeare Theater Company would make the dress. In less than a week. I had never even met her, but her email buoyed me: "I also have a daughter I'd do anything for. We can do this. Here's the plan. Here's the kind of zipper I need." Victoria, we are forever indebted to your "let's get this done" attitude! I guess I could have driven Emma to the mall and said, "pick one." But where's the fun in that? She will only be 15-3/4 and going to her first prom once. For that matter, I'll only be 48-3/4 and living May 8, 2008, once, so the same principles should apply. We first met in the costume room of the Shakespeare company surrounded by brocades, golds, waistcoats, petticoats. Emma was measured to within an inch (literally) of her life. I ordered the pattern. Picked it up. Took it to the sewist, as Edie calls them. The sewist emailed Instructions for Idiots to Take to the Fabric Store. We visited fabric stores to see black satin. Who knew there was more than one kind? "Looks too much like leather." "Too loud when you move it." I needed to buy carbon offsets just for the trips it took to find the right satin at Foam and Fabric. We sat and waited for days while Victoria did her magic. If by "waiting," what you mean is "searching for the perfect shoes, a black crinoline, and a dainty purse in which to carry a cell phone that is never farther than no inches from her hand." Emma busied herself the whole week by practicing walking in her shoes. She only fell down the stairs once, a tragedy we both responded to not by questioning whether she was hurt, but by checking to make sure the heels weren't broken. Finally, the call to come over and be fitted, so the hemming could begin. It was beautiful. Emma beamed that beamy smile that seems like she can't stop smiling it when she is really, really happy. Tarantulas have never, ever tasted so good. "I would have finished it last night," Victoria said when she finally called on Friday, the day before the prom. "But my hand cramped up at 2-1/2 hours of hemming. Am doing it all by hand because it'll look nicer." Took her four hours to hem that dress. Kilt Boy arrived right on time, looking absolutely dashing in his Montreat tartan kilt, with white roses for a corsage. 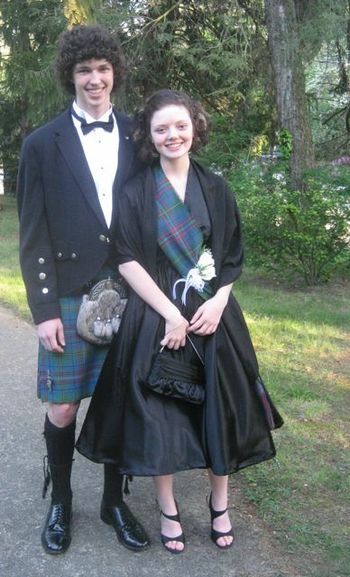 Did I mention that I love the fact that he wore a kilt to the prom? We left them alone while he adorned her with a beautiful sash of tartan to match his, pinned very meticulously with a pin from his kilt. They looked young and happy and slightly nervous but only because there were Adults Intently Staring at Them. "Don't forget to get your photograph made at the prom," I yelled after them as they escaped. Do you see an official photograph posted here? I thought not. "Do you remember that party we had for you after the prom your junior year?" my mother asked when I called to tell her they were gone. "Um...sure?" I said. "Sissy and I spent hours rolling grapes in sugar for that party--do you remember that? I hope you remember it, so it wasn't all in vain!" she said brightly. Will Emma remember all this? I don't know. But I will. Perhaps it'll be like sugar-rolled grapes that I kind of remember, but my mother really remembers. Ask for help to make the dress of your dreams. Roll a thousand and one grapes in sugar. Find the perfect shoes and practice wearing them. Eat tarantulas for someone else. And, like the sewist--Victoria--every once in a while, eat raw tarantulas in hot sauce for someone you have never even met. Hi Patti--I love this entry! For the record, your documentation of their first prom night is longer, more eloquent and funnier than mine. I posted the same photos and all my 'friends' gushed over how adorable they looked (she's known affectionately as 'TubaGirl.) And who am I to argue with my internet friends? They are absolutely right. Thank you again for sending the images. Our extended family is very grateful. Please tell me that I am not the only one who read this with the words wavering on the page. The shoes are so doggone pretty and perfect. In fact, I like their feet the best in the shot of the two of them together. I, too, had a mother who would eat those tarantulas and was hemming my prom dress as I fixed my hair. My date arrived some twenty minutes later. Best thing is...I'd eat tarantulas for my son who would eat them for his baby daughter. Beautiful how that works, isn't it? Beautiful young lady! :) Lovely pictures. Right as I was thinking this, I started counting on my fingers. In exactly seven years my daughter will only be 15-3/4 and going to her first prom once. For that matter, I'll only be 48-3/4 and living May 8, 2015, once. Emma is so lovely. 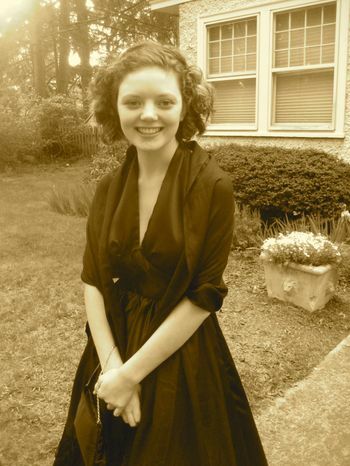 My daughter never went to any high school dances or proms. I guess I will have to wait for her to get married to have that "eat raw tarantulas in hot sauce and go to any lengths to find or create the perfect dress" experience. she looks gorgeous, ethereal, + timeless. "Hit the road, Jack and don't you come back, no more, no more, no more, no more!" That is me, eating tarantulas in hot sauce for my two year old daughter. Don't ask me why, but she absolutely loves that song so while we're in the car, it's all we listen to. I counted. We listened to it 18 times in the car today. Of course I sing it at 1 am in my sleep and in the shower and while working out (listening to other music). But nothing beats the way she waves her finger back and forth in the air and sings "No more, no more, no more, no more!" Bring on the tarantulas! This post makes me happy. So I can only imagine what it has done for you, and for Emma, for the sewist, for Kiltboy, and for everyone else involved. She looks so beautiful!!! What a wonderful story. gotta love a boy who is brave enough to wear a kilt to prom ... and a girl who is dear enough to see past the kilt and those bare knees! I love, love the dress - may need something like it for my wedding. May need to have it made. I love starting my day by reading posts such as this. It reminds me of a time when my little one (now 27) wanted to be a unicorn for Halloween - I had one heck of a time making that horn stick on the cap but I did it -and then she wanted a purple tail -so I took the gray yarn tail off of the leotard and to the yarn store I went - and she was the cutest unicorn in thw world - and we still have that costume - just in case we ever need one again! Ah,sweet memories! Almost erases the memory of my one (AWFUL) prom. I hope I remember your experience and not mine when it's my daughter's turn in, oh, 10 or so years. Eat tarantulas? Well, spiders give me the willies, so could it be diced very finely and sauted with a nice herb-infused oil first? And could I wait to find out it was a tarantula after I've eaten it? Or does that not count as sacrificial enough? I never thought I would say this...gulp...I see this post and want to be a mom. Your daughter is so beautiful. And this post is so true and wonderful. It makes my chest ache and my eyes tear up and all with gratitude for the people in this world who care like this. You make me cry in the very best way.